Fish Feeding Times at Aquascene, Doctor's Gully, Darwin are determined by tides. Milkfish, mullet, catfish, barramundi and more come in to be hand fed at high tide. Click the month to check daily opening times carefully - sometimes there is not enough tide, occasionally there are two sessions a day, and they can vary from one hour to three hours in length. 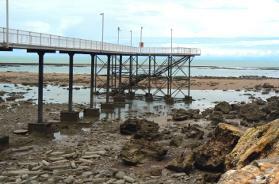 The photo of Nightcliff Jetty at low tide shows how far tidal levels can change in Darwin.